So how can you find peace when you don’t get along with a parent? By doing your hare mostly- and knowing that you did what you could to save the relationship. It all really starts long before the child is even born. If you are not getting along with you parent or parents, it may help you feel better knowing that it is not your fault. It starts from an early age when you as a child have no responsibility what so ever. Most likely, the parent was not fit or ready to be a parent. Of course, there are valuable reasons why a parent may be unfit or naive. At this point it is important to acknowledge that there may be a number of reasons why you and your parent(s) are not getting along. Reflect back and try to figure out what makes your parents tick and what may have lead to the conflicts existing between you. When considering all aspects, it is important to disregard the feelings of the heart (meaning emotions that can cloud your judgment) and really look at things as they are, which can be challenging, but it is important to try. All those factors and more can make a difference for a parent to have a better understanding of their children. They can create the proper tactics to educate a child, as well as guide them lovingly in the direction of their beliefs. However, it would also be important to not neglect the personality of the child in this process, for each child is unique—whether it has to do with learning ability, personality, etc and sometimes parents do not understand this and this is where problems start. It is true that many families raise their children with apparently no problems, but that is only what everyone claims. However, when looking deeply within each member, especially the children, it may not be true. Often children can fall into rituals or habits of obeying their parents, but that does not mean there are not any problems. Humans can easily get lost in following patterns, traditions, etc. Many individuals are afraid to reveal their desires or differences of opinion, especially children to their parents. For that reason, many appear obedient, humble, and happy- and it could easily be the opposite. In fact, by pleasing your parents without making mistakes, you are not having much of a gain. The child may be losing the true meaning of their life pleasing their parent(s), when they could actually be fulfilling their authenticity and finding themselves. A child who does not get along with their parent(s) is really a child who is exercising their strengths to overcome the obstacle of trying to make his/her points or trying to share his/her views as an individual. The naive parent will clash with this particular type of personality, assuming their child is just disrespectful and wild. It may be a frequent occasion that is vaguely spoken about or displayed. In this type of situation, it is best to not feel guilty. Find comfort and happiness in knowing that it is the nature of the child and the parent. 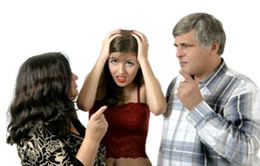 Do not forget that there may be valuable reasons why you and your parent(s) are not getting along; it is not your fault. It is not because your parent(s) have a lack of love for you, that you are a bad person or that you are just plain unlikeable. It could be that they just disagree with your choices, desires, views and/or decisions. Keep in mind that every individual’s mind is a separate world. With that said, it is also very possible that you share the same strengths and weaknesses as your parent(s), whom you are conflicting with intensely and sometime similarities like this can also create conflicts. Make things better with your parent(s) by communication more openly. Communication is essential! Find the right moment to speak with your parent(s). Remember to be kind and respectful toward him/her and be sincere. After all, there is a lot to gain, and also a lot to lose—for both parties. Let them know how they honestly make you feel and express yourself fully so they can hear and see how you have been affected. If you have ever felt unfulfilled by the responses of your parent(s), it is important for you to know that the parent(s) most likely suffers the same dissatisfaction or more—whether it is expressed or not. It may take time for you and your parent(s) to come to a point of understanding and will not happen over night. Grow closer to the parent(s) by getting to know them. Besides just letting them know how you feel, get to know how they feel, so you too can have a better understanding of how they think and feel about certain things. There is no guarantee that the outcome will be positive, but it is worth the effort. When you know you really put in your best efforts to improve the relationship, you will at least know you did your part and showed your love and interest in making things better. Remember, it is no one’s fault to have differences. A child and his/her parent(s) must have differences to some degree. It is also important to remember to do only your best, and that there is a side you are not responsible for. Consider all aspects—you must use your heart along with your intellectuality. If you consider yourself a more skillful child than your parents, then use that ability to get close and to find an understanding with them. This may prevent you from feeling unloved or having feeling guilt that you do not deserve to feel. Take it on slow step at a time and eventually you will reach a point where you will be able to decide whether you can have a close relationship with your parent or if keeping a healthy distance is best for you and everyone involved.